On the east side of Route 14, south of the Toganenwood B&B, is something that looks like a raised berm, possibly a railroad grading. It is visible from the road, unobscured. In at least two places, there is a cut perpendicular to the grading or berm, that looks similar to me to other perpendicular cuts in railroad grading that I have seen. Sorry, I didn't stop for a picture. Here is a link to what I saw. The official map that I saw in the Wayne County Clerk's Office showed the P&SB going through the west edge of the Village of Clyde. Given the meander at the location you depict, I speculate that it's related to the river, not a railroad. Hi, I am new to this forum thanks in part to this topic. I used to live in Trumansburg from my birth in 1952, till I left in 1970. My parents owned a farm in Halseyville, NY and I am very familiar with the Penn - Sodus RR. Actually, the line formed the back west border of our farm with Taughanock creek forming the north border. 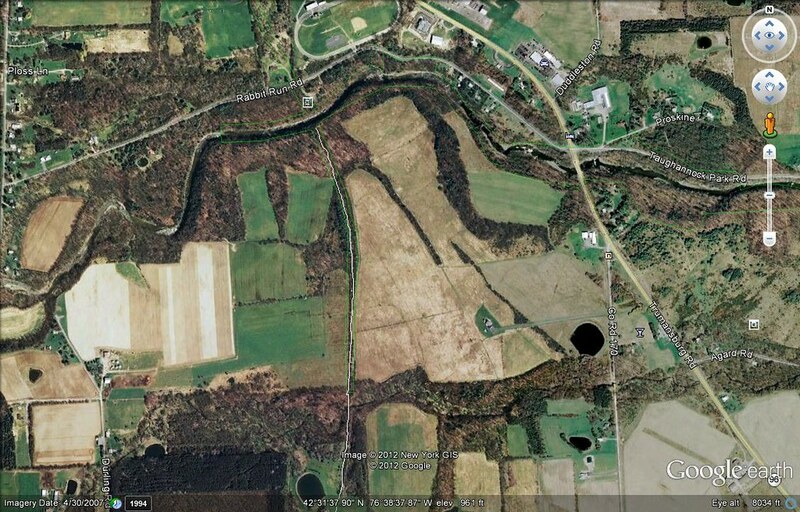 Our farm was located on the corner of NYS 96 and Halseyville - Enfield Road. Below is a picture of our old farm showing the northwest corner. Note the white line represents the rail bed - at the north end of that line is the rail abutment for the trestle that was never built over Taughanock Creek. Built in 1873, the abutment was still there at the time of this writing. At one time (1945 - 98), the 212 acre farm belonged to Robert Dean and Camille Murphey my dad and mom. It is my recent understanding that the rail-bed and abutment are severely overgrown making it now nearly impossible to be seen from the farm, and as you can judge from the pictures it is almost impossible to be seen from the creek bed. Last edited by gdmurphey on Fri Jun 29, 2012 11:30 am, edited 1 time in total. "Down by the station, early in the morning. See the puffer bellies all in a row. Hear the station master shoutin', "ALL ABOARD"! Huff, puff, toot, toot ------- off we go. I've seen that map before. It's reasonably accurate towards the south end, but is not very accurate towards the north. It takes a big looping curve to the east at Ovid, going due west at one point then turning 90 degrees to the north, and another curve at Fayette. This knowledge is from field research, studying aerial photography, and finding the original 140-year-old maps in the county clerk's office. Whoa! If I understand you correctly, there were *two* P&SB railbeds on your family's farm?? The one white line, and the other further to the east between the two green lines?? That's kinda crazy stuff. So it's an unfinished abandoned unfinished railroad? 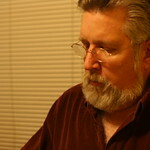 RussNelson wrote: I've seen that map before. It's reasonably accurate towards the south end, but is not very accurate towards the north. It takes a big looping curve to the east at Ovid, going due west at one point then turning 90 degrees to the north, and another curve at Fayette. This knowledge is from field research, studying aerial photography, and finding the original 140-year-old maps in the county clerk's office. Ahhhh, you edited the picture on Flickr to match my understanding. Kinda disappointing actually. Would have been great to find (another) abandoned unfinished railroad. 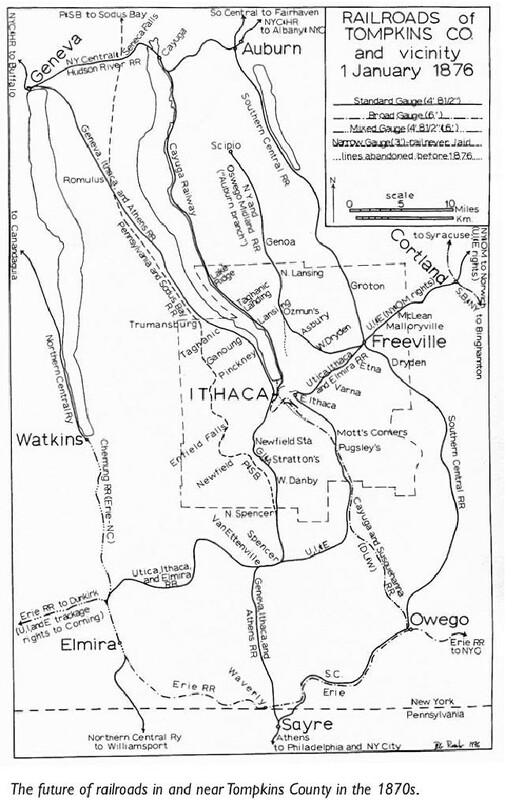 The (other) one to which I refer is a section of the Saratoga & Sackets Harbor railway. It was finished to North Creek and a few miles beyond, but there's a short piece which which was going to route the railbed a bit to the west of where it actually ran. Unfinished culverts, fills, and cuts. Plenty of coolness to look at.